SI Edinburgh is a friendly club, so we try to mix our business and pleasure activities. We can have a lot of fun fund raising or increasing our profile or working with one of our projects. This was held at President Gari’s home, in the countryside on the outskirts of Edinburgh. We were joined by young women from UNA House including Navya – whose mother is from our new Friendship Link in Madura. The weather was ideal (apart from the midgies) and a few brave souls even went swimming! Long service club awards were presented by President Gari and Anna received her Past President’s badge. Each recipient was asked by President Gari what her Soroptimism had meant for her – what a diverse response! The ‘tent roof’ lifting is in aid of forthcoming wedding of Gari and Malcolm’s daughter to be held in August – it would be lovely if they get similar weather to our evening yesterday! Anyway it makes quite a comic photo with Pat in charge ‘raising the roof for Soroptimism’. International President Yvonne was installed at the SI Board in Istanbul for her Biennium by Past International President Anne Garvie, who is from Scotland South. At our recent AGM Long Service awards were made to 4 outstanding Soroptimists by Isabel Smith who was chairing the meeting. Irene Smith, Mary Bell, Yvonne Wilson, Dorothy Reilly, were the recipients. Congratulations and thanks to all for their committed service to women and girls through Soroptimism. SI Edinburgh members attending the SIGBI Conference at Harrogate in 2014 were able to renew friendships with members from clubs in SI Nigeria. SI Abuja are building a school classroom for a village school so SI Edinburgh were able to help with a cash donation which was presented at Harrogate. SIGBI President Pat with members of SI Edinburgh plus boxes of knickers and socks. At the end of October 2013 members attended the SIGBI Conference in NewcastleGateshead where they presented president Pat with boxes of knickers and socks for the legacy project for the homeless, Under the Bridge www.underthebridge.org.uk In September 2013 SI Kiyiv in Ukraine celebrated its 10th Soroptimist Anniversary. One of the SI Edinburgh members, Winifred, visits regularly and keeps in touch. She was able to join them for this celebration and make a donation to their projects. Over the summer months the city of Edinburgh has many visitors; SI Edinburgh is very happy to meet with our sister Soroptimists usually to exchange ideas and talk over a meal. We were delighted to welcome Funlola Buraimoh-Ademuyewo, President of the National Association of Nigeria and her husband to join us for afternoon tea at the Tower restaurant. Margaret Thompson brought along photographs of her time as a nurse in Nigeria and everyone had a fun time listening to her stories. Members of SI Edinburgh have been attending the SI Europe Congress, Soroptimists Go for Water and Food, in Berlin. For more information http://www.soroptimist.waterandfood.eu/en/index.html Energising speakers, great friendship and interesting activities for 3 days. Our new Honorary member, Morag Insley was there with her son and daughter in law who is also a Soroptimist. They met up with old friends, here Robyn Cain from Western Australia, in the art deco building where the gala dinner was held. As part of our celebrations we have had a bench provided by the club for Princes St Gardens refurbished. It now looks very smart and is being put to good use. SI Edinburgh started its 85th charter anniversary celebrations with a reception at Edinburgh City Hall, hosted by the deputy Lord Provost and attended by partners from charity organisations as well as members of other clubs in Southern Scotland. President Christine listens as Deputy Lord Provost addresses the reception. 2 days later the club members hosted an afternoon tea party dressed in the costumes of the last 85 years. SIEdinburgh members were joined by 100 Soroptimists from all over Scotland, including SI President Elect Ann Garvie from Glasgow and SI Treasurer Pat Carruthers from Perth. Ann Garvie congratulated the club on the work they had done over the years and looked forward to greater success in the future. The Royal Scots Club provided a magnificent setting and an even more magnificent high tea which was enjoyed by all. The celebration cake was made by SIE President Elect Ann’s daughter. A display of photos of activities demonstrated the Programme Action work of SI Edinburgh. Members entertained Soroptimists from the Ukraine to afternoon tea at the Tower Restaurant in the Scottish Museum with excellent views of Edinburgh Castle. 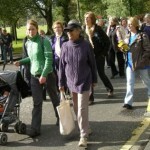 The May weather in Scotland was cold but the Soroptimists managed plenty of sight seeing. There are International Conventions held every four years at which international links and friendships can be renewed. In July 2011 some of our members partcipated in the International Convention in Montreal. 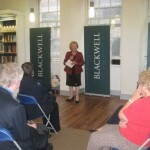 Two of our members had book launches in 2010.